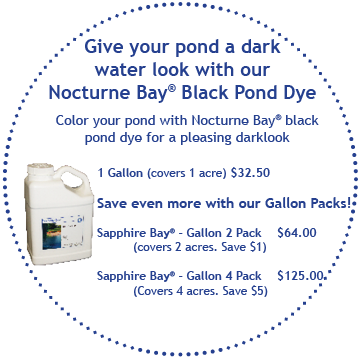 Loch Ness is an effective black pond dye that will darken your pond significantly and provide a more pure, reflective quality. 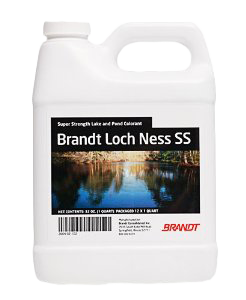 Great for ponds in wooded, natural areas, Loch Ness is best applied late in the season to limit the amount of weed regeneration in the coming season. Loch Ness black pond dye will help limit the amount of weed regeneration in the coming season. Pond dyes are best used in conjunction with herbicide and algaecide products, as each fight pond weeds and algae in different ways. Loch Ness is aesthetically pleasing and is used in many aquatic applications for a rich deep, dark and clean appearance. All dyes are food-grades and pose no threat to wildlife. This means there are no restrictions on swimming, fishing, irrigation, or livestock watering when using a pond dye. Directions for use: Apply at the rate of 1 quart per each surface acre of water 4 feet deep. Additional amounts may be added if deeper color is required. Manufactured by Brandt Consolidated, Inc. I prefer the darker black color over blues. I think the darker color lets less light in, so less bad growth. The blue color to too much like the Tidey Bowl effect, not natural. I like black due because it looks very natural and this product works good. PS- it doesn't really turn the pond black, it just gives it a darker hue. The blue dye makes pond water look fake or not natural.